These disease carrying insects are often found on pets, in the house and around the yard. 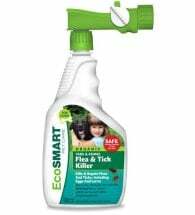 Here’s how to get rid of fleas FAST using proven, natural and organic remedies. Deodorizes and creates a non-toxic barrier for unwanted problems - year round! 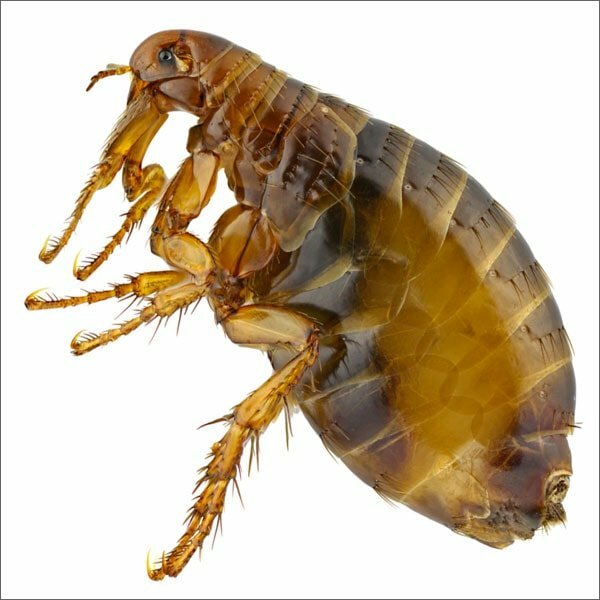 While there are more than 200 species of fleas in this country, the primary troublemaker is the cat flea (Ctenocephalides felis). Happy to feed on anyone in the house (dog, cat or human), these wingless insects will most likely choose a pet, whose fur provides warmth and shelter for their breeding ground. Flea bites make some animals, who are allergic to the insects saliva, so miserable that they gnaw and scratch themselves raw. Human bites show up as small, red, itchy bumps most commonly observed on the wrists and ankles. 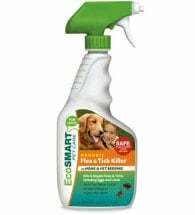 Read on to learn our 10 step treatment program for getting rid of fleas naturally and save BIG money doing it yourself! Adult fleas are small (1/16 inch long), dark, reddish-brown, blood-sucking insects. The body is vertically flat (like a fish), hard and covered with many hairs and short spines that point backward. Legs are long and well adapted for jumping. The mouthparts of an adult flea are adapted for sucking blood from a host. Immature or larval stages are small (1/4 inch long) white worms with dark heads. They avoid light and are often found around pet sleeping areas, along baseboards, in carpets or on furniture. Female fleas lay as many as 50 eggs a day, starting a life-cycle that can be completed in as little as three weeks, depending on temperature and humidity. The eggs hatch into larvae, which feed on “dirt,” excrement of partially digested blood. Larvae grow and molt twice, then spin cocoons, where they grow to pupae and then adults. The adult remains in the cocoon until vibrations indicate a host is nearby. This waiting can extend the life-cycle. It also explains why large numbers of fleas often are seen when an empty building is occupied. Six-legged adults emerge and attach to a host to feed and breed, beginning the cycle all over again. Establish a single pet sleeping area that can be cleaned easily and regularly. Limit your pet from accessing bedrooms, attics, basements or wherever the flea population may be particularly annoying or where cleaning is difficult. Vacuum areas frequented by your pet on a regular basis. 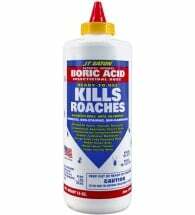 Dust Boric Acid Powder over floors (cement, wooden, tile, linoleum), along baseboards and in household areas (excluding carpets and upholstery) where fleas are a problem. Treat flooring beneath and around pet’s bedding and sleeping quarters in garages, porches, crawl spaces and shelters. Regularly remove and wash all bedding and rugs that your pet comes into contact with. Comb your pet often and use herbal shampoos and pet collars to create a natural barrier for unwanted problems. 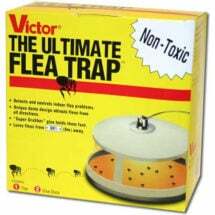 The Ultimate Flea Trap can be used to monitor and trap biting adults. 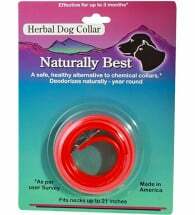 Non-toxic, safe and very effective! 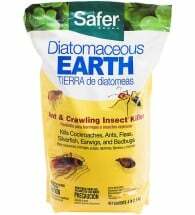 Apply organic Diatomaceous Earth for long-lasting protection. Made up of tiny fossilized aquatic organisms, that look like broken glass under the microscope, DE kills by scoring an insect’s outer layer as it crawls over the fine powder. Contains NO toxic poisons! Beneficial nematodes work outdoors to kill larvae — before they become biting adults! Treat shaded areas and around structures anytime the ground is not frozen. Least-toxic botanical insecticides should be used as a last resort. 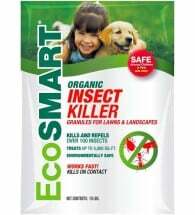 Derived from plants which have insecticidal properties, these natural pesticides have fewer harmful side effects than synthetic chemicals and break down more quickly in the environment. Tip: Frequent vacuuming will remove up to 95 percent of all eggs, some larvae and adults. After vacuuming, remove the bag and place it in a sealed outdoor trash container. Results show an amazing 93% catch rate! 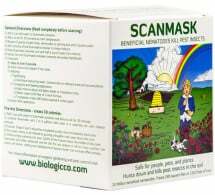 Contains no toxic chemicals or synthetic sprays. Easy to apply formula works on contact, yet is completely safe around children and pets! This ready to use powder kills bugs fast but is no more toxic than table salt. 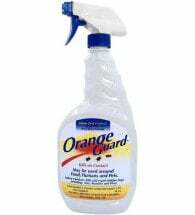 Made from citrus peel extract, Orange Guard kills and repels for weeks -- without worry!